Hispanicize, the largest annual event for Latino trendsetters and newsmakers in journalism, blogging, marketing, entertainment and tech entrepreneurship, has selected República, one of America’s leading independent cross-cultural advertising, digital and communications agencies, as its agency of record. Manny Ruiz, chairman and founder of Hispanicize, made the announcement at the Miami-edition of “Hispanicize HX,” the kick-off event of Hispanicize 2015, which was held at the Viceroy Miami on September 3rd. 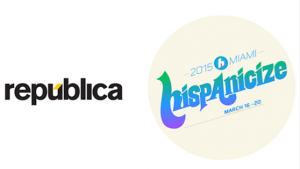 Hispanicize 2015 will take place March 16-20 in Miami, Florida. Since its founding in 2006, República, one of the fastest-growing independent agencies in the country, has been advising global, national and regional brands on how best to reach broader U.S. consumer segments cross-culturally.